Company Name: Yushi-Seihin Co., Ltd. Since our establishment in 1947, we have dealt as a chemical trading company, supplying oil and fat products including industrial oils, fats, raw materials for soap, foods and fibers. We currently cover various fields including chemical products of oils and fats, petrochemical products, polymerization catalysts for synthetic resins, modifiers and additives, plastic products such as packaging materials and films, fiber products, specialty lubricants for electronics, raw materials for pet foods, pharmaceuticals, cosmetics, and health foods. We provide high quality oil and fat products to around the world. We have offices in Singapore, Toronto, and Silicon Valley, and we also have local cooperate offices in Hong Kong and Shanghai. We engaged in business not only in Japan but also abroad, we are positively making business development for the future growth. We established YS Tech co., Ltd. at Suita-Shi, Osaka in 2010, to produce and sale for Clean room supply and developed heat resistant/chemical resistant Barcode label for the factory automation (FA) business. We propose various methods including technique. Yushi-Seihin plays an indispensable coordinating role in trading business. We deal in various raw materials and products are being led to the place in demand of suppliers. 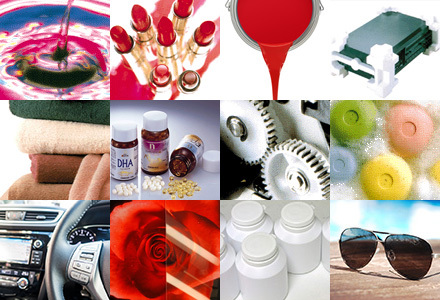 Yushi-Seihin supplies raw materials related to Pharmaceuticals, Cosmetics and food associated materials. We supply accumulation of medicine to diseased part, accelerate absorption, controlled release for Drag Delivery System (DDS) which is ideal drag administration and raw materials for health food which is prevention for lifestyle disease. Yushi-Seihin takes on from planning to the original equipment manufacturing of tip merchandise. We supply various kinds of functional extracts such as tea catechin and astringent persimmon extract to manufactures. We also provide the original equipment manufacturing products which include functional extracts. Yushi-Seihin develops merchandise and material to the consumer with various ideas. We plan, exploit, and supply the specialty products collaborating with manufacturers. Yushi-Seihin supplies the raw materials of pet foods to pet food manufacturing companies. We also sell the raw materials with various extracts for improving tastes. We can supply the domestic and safe pet food raw materials. ushi-Seihin supplies lubricants to various manufactures and it helps to work machines and electrical appliances smoothly. We supply lubricants for plastics which do not affect plastics and used especially car and electrical appliances. Automobile and home electric products need lubricants in order to make it work inside its parts. We advise to use appropriate lubricants parts by parts. Yushi-Seihin handles raw materials, coatings agents, and lenses itself. We have various selections to meet customer’s diverse needs. HEAPROOF applicators have been designed to apply variable product identification and barcoding directly to hot materials such as hot steel and aluminum.